A few years ago, it was rare to find even high-speed Internet in the Greek Islands. If I remember correctly, it was all dial-up except for one cafe I found in Iraklio, Crete. Things have changed, and now WiFi Internet can easily be found in the Islands. There are a growing number of places in the Greek Islands that offer WiFi Internet. Just ask your hostel, hotel or campground -- if they don't offer WiFi they should be able to point you in the right direction. Otherwise walk by cafes and look for a sign that says "WiFi" -- or just ask. In the main town of Paros there is at least one cafe along the waterfront with WiFi (1 euro connection fee, otherwise free to use with purchase). I stayed at Camping Koula on Paros which offered free WiFi to guests. Non-guests paid a low hourly rate. 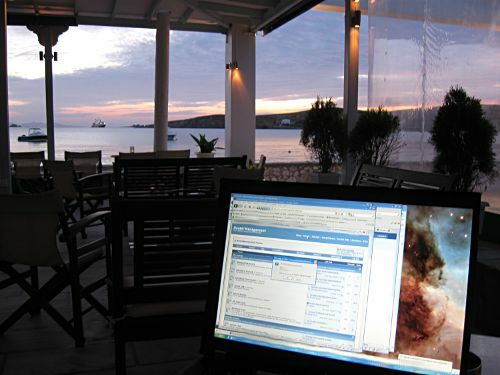 On Naxos, Soula Hotel offers free WiFi for guests. There is also free WiFi at Cafe Musses next to Poseidon Hotel at St George's Beach (Tel: 22850 25078), as well as at several cafes along the waterfront of Naxos Town. I highly recommend the friendly Rental Center in Naxos (Tel: 22850 23395). I paid €2 per hour for Internet access with my laptop (sometimes WiFi, sometimes plugged in). If you don't want to buy a drink, €2 per hour can be cheaper than going to a cafe/bar. In Paleochora, Crete, there is a friendly Internet Cafe called Coronet Internet. It's 10 euros for a 6 hour pass, but sometimes it's cheaper to pay for Internet access than to keep buying overpriced drinks at a bar to use a bar's "free Internet." In Agios Nikolaos, Crete, try Starbites at Kondilaki 1 by the lake (Telephone 28410 22224). They offer free WiFi Internet and cheap sandwiches 24 hours a day. There's also a bar next to the lake called Cafe du Lac that has free WiFi and Internet access on desktop computers. Basically, you can find free or inexpensive WiFi of some sort everywhere in touristy areas of the Greek Islands. Just ask at any Internet Cafe or tourist-oriented cafe. The government in Greece are implementing public Wi-Fi hotspots in every town; the local government on the island need only implement this free Wi-Fi program. According to the taxi driver, 'Connex' are the current service provider for the nationwide scheme and the default Wi-Fi code to log on is 1234567890–123 or 4 I never got the opportunity to test this myself so I’d welcome any input from others. If anyone has more information on the free Government WiFi in Greece, please leave a comment below.